Speaking of Cecil McEachern, here’s another of his fine compositions. Don Messer recorded it as a single in 1950, a year before Mr. McEachern had even joined the band. Though it never made it onto any of Don’s LPs it was nonetheless picked up by fiddlers in the Pacific Northwest, presumably from either the earlier recording or via radio play. You can go to YouTube and hear Don Messer play this or you can visit Lonesome Lefty’s Scratchy Attic (http://scratchyattic.blogspot.com/) and down load it, along with a whole pile of Don’s singles his lonesomeness has compiled as an album. 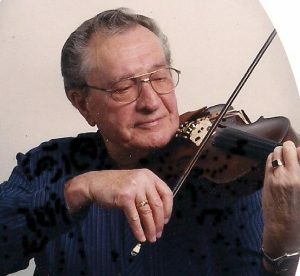 This transcription is from the playing of Charlie Johnson – Kansas, Idaho and eventually Oregon, Old Time Fiddler extraordinaire (Calgary Schottische, April, 2009 of the Evergreen Fiddler). He referred to it as “McEachern’s Reel.” Notice how in the third measure of the b part the note pattern reverses itself. This gives a quick little syncopated hop and is reminiscent of the double shuffle. Along with the shift in note patterns a common phrasing element (assuming you are using the common down-up single bow style), especially in French Canadian influenced styles, is to reduce the attack on the down bow (F# in this case) and hit the up bow a little harder (B and A), briefly reversing the rhythmic emphasis. Perks it up a bit and catches the dancers’ attention, or at least gets them hopping a little more. Gil Kiesecker uses this trick on occasion, as do other western fiddlers; even Oklahoman Gary Lee Moore sneaks it in. But, the Quebecois fiddlers are the ones who have taken it to new heights. I look forward to playing this tune for some dances and jam sessions, hope you do too.